It is now very clear that neither the Hindus nor the Brahmins had to do anything with the Panchama Varna. It was the invention of the British as part of their Divide and Rule policy. These days some Indian intellectuals and western intellectuals are addressing Scheduled Castes as Panchamas. They argue that Scheduled Castes are outside of the 4 varnas of the Vedic Lineage and hence they are known as Panchamas. Some even went a step further and blamed Hinduism and Brahmins. Another argument was that the Scheduled Castes were Dravidians and hence they were not part of the chaturvarna system. As per the Oxford online dictionary, Panchamas are scheduled castes outside of Brahminic division. The western world and most part of the Indian society strongly believe that Panchamas are outside 4 Hindu Varnas. If we look at the definition in the Oxford online dictionary closely, we can see the word “Brahminic”. Rather than using Vedic or Hinduism or Sanatana dharmic, the British coined this word Brahminism to target brahmins, who were the knowledge bearers of India at that time. British used the word Brahminism because Vedic Hinduism was preached and protected by Brahmins. By the same token, the British must call Christianity as pastorism or fatherism and Islam as mullaism. Because Christianity and Islam are being preached and protected by pastors and mullahs. It is well known that Brahmana, Kshatriya, Vaisya, Sudra varnas were formed based on Satva, Rajasa, Tamo gunas and by their profession(karma). The same was mentioned in Bhagavad-Gita by Bhagavan Sri Krishna. Now let’s look at the history and see how this word Panchama came into effect. The European rulers of India did not understand the varna concept and added their imagination to the Varna system and gave birth to the neo Hindu Caste system which we are seeing today. While British were ruling India, they decided to prepare a census of Indians with the intention of making more people to pay tax. During this process, they adopted various methods. The present-day Door number system which is being followed in Bharat was introduced by the British when doing the census. In 1931 H.V. Nanjundayya in his book Mysore Tribes and Castes (Vol 4) says that Panchama was a recent creation, he said it was the word coined to identify the Madiga and Holeya castes. H.V. Nanjundayya authored Mysore tribes and castes (4 volumes). In the year 1871 British government did a census in Madras presidency. The report prepared by then census office of W.R. Cornish has some facts that can surprise many Indians. He confirmed in his report that Hindus were divided into 5 varnas, and he mentioned that it was done by “The committee of the Madras Town Census” and later it was applied to the whole British imperial census. If we look at this committee report, the British openly admitted that they knew little about the Hindu Varna and Jati system. British blamed Hindus for not knowing their ancestor’s History. Yet they decided to categorize the people with the European Christian lens and claimed that all they did was to do as Hindu laws actually commanded. There are many sakhas in each Kula. For example, in Telugu Brahmana there are Vaidiki, Niyogi, smartha…. etc. and each of these Sakhas also have Upa-Sakhas. For example, Vaidiki Telaganya, Vaidiki Velanadu … etc. Same applies to all Varnas. While categorizing classes “The committee of the Madras Town Census” decided to divide all Sudra Sakhas and made them to different castes, on the other hand in the other Varnas British put all sakhas in one respective category. 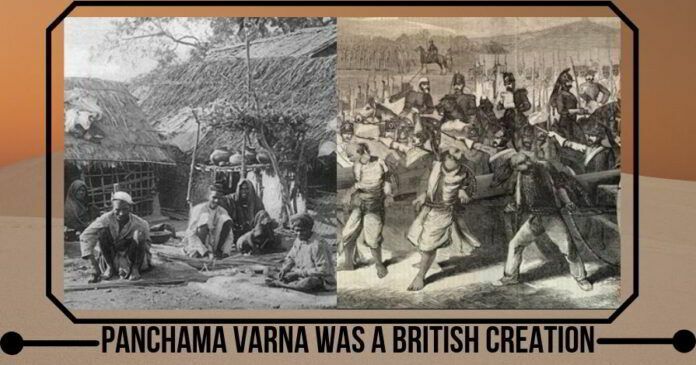 To make it short British divided all Shudra varna people into different castes. It was in this “The committee of the Madras Town Census” meeting the Schedule castes were carved out of Vedic Varna system. This gave birth to Panchama varna or Panchama Varga. Aryan Dravidian theory further confused Indians and made them believe that Scheduled Castes were out of Hindu Varna system. All Castes were part of different Varnas and there were no Panchamas in Hindu society before 1869. It is now very clear that neither the Hindus nor the Brahmins had to do anything with the Panchama Varna. It was the invention of the British as part of their Divide and Rule policy. This event happened in 1869, almost 150 years ago. In the present day, it has taken a completely different form and we can see how the British dictionary itself is giving wrong information about the panchamas by declaring them as those outside the 4 Varnas. Many evangelical missionaries are using this panchama varna construct to further confuse the scheduled castes and convert them. Under the British Christian regime, the scheduled caste people also got robbed financially. Brahmins these days are facing all sorts of criticism for many things they did not do. One such thing is the creation of the Panchama Varna. It is very clear that everyone in the Hindu society was part of Sanatana Dharmic Varna system. This shows how the British Christian world has manipulated the Hindus and divided them in order to effectively rule over them. Over the years, however, with the British leaving India and India having attained her independence, the blame conveniently got passed on to Brahmins. Every society, every community has both good and bad. Perhaps Brahmins may have committed some errors in those times without thinking of the future implications of their short-sighted action, but the world should stop accusing them for things they did not do. Maybe its time to re-examine many of the allegations levelled against Brahmins by the western Christian world and now actively propagated with even more zeal by the Leftist cabal which dominates the humanities departments in the top influential and prestigious universities in India. Great article but the culprits are still the Hindus who felt secured with the various “titles” bestowed upon them by the White Rajah who ruled an already divided polity. The Brahmins, already tried to hijack the Varna system imposing a birthright to it but giving the Kshatriyas the upper hand to protect them and the Vaishyas to provide the wealth to sustain them and the Shudras the labour to serve them. Whatever the origins, it is most sinister for the Hindus themselves to have allowed the White Rajahs to dictate the term without an iota of objection to this rebranding. Even today the Hindus are their own worst enemies, divisive, split in personality and ready to usurp a fellow Hindu shamelessly even if the persona ruling the nation is an Italian. How can they decide the faith of millions if they were appointed…? Don’t publish any of my messages..
No politician is strong willed to foresee the dangers for India. One thing is certain… If Hinduism perishes it will destroy the whole world. Why intellectuals don’t question Christian Faith’s…which is full of idiotic things.. In Muslim n Christian writings there is no equality ..whatever God (supposedly) gave they followed. Kudos pgurus for this nice article. This article genuinely presents a valid fact. People should realise that most blames on Hinduism done by christian missionaries are results of inability to understand more sophisticated sanathana dharma and trying fit the sanathana dharma into the barbaric western mould. i would rather request the Pgurus team to expose the White Racism and the White supremacist barbaric ideology that is Christianity, right from the extermination of natives to the Black Slavery to the forced abortions of Native Indians, the genocide against Mayas ever as late as 90s, continuing genocide in CAR because the Muslim by chance won the elections, the continuing genocide of brown natives by whites in South and Latin America, aticle after article, This WHITE SUPREMACIST, KLANNIST, EVIL barbaric ideology of genocide, the Padrism, needs to be exposed and exposed relentlessly, all this Brahminism (meaning Hindusim targetting) can be more than met. Those lecturing us from the White countries, propagate a worst form of human degradation, on the color of skin. Still Blacks are shot for being blacks in Europe. Did Hinduism have Casteism till White Christian ideology of genocide arrival?? My foot.. Have they not heard of Maurya, Licchavi, Pandian, Nandas, Gupta, Gujjar Pratihar, Parmar, Saka, Yadava, Matasya empires..ALL TODAY SC/OBC, ANY BRAHMIN ABOVE???? Casteism in this form was perpetuated by White Christians and their mercenaries, prds of their keeps the Xtians, who picked the worst of White racism to please their White masters and many BeefBrahmins captured the temples. And most of them are with Italian Nazi Cabal called INC . Many of these Beef Brahmins cannot digest Narendra Modi because he is a NATIVE INDIAN, NON GORA DNA-FDI MBC. These are rancid C..nt converts who do not change their names, Is there ANY BLACK OR BROWN XTAN COUNTRY WHICH IS RICH??? They are beggers? Any White Klannist genocidal ideology country which is giving reservations for Blacks, browns, Natives for all the barbarity?? Any BLACK BILLIONARE which can be mentioned in supposed FREE WORLD??? Still Blacks have to beg and say #blacklivesmatter. We rever BabaSaheb, what White Christians did to Martin Luther King??? Shot him just for asking a RIGHT TO LIFE?? Till 1979 IT WAS LEGAL IN US TO LYNCH A BLACK OR BROWN IF HE HAD A WHITE GF??? All the present day politicians should understand this and stop creating divisions within Hindus. UK in short is a non existent country. Nothing is left after it leaves Europe. Only crooks and scoundrels from India, Nigeria, Pakistan, and Russia live there with ISIS terrorists. So request all to ignore this country as it has become decayed.